They follow us around the house, cuddle in our lap, sleep by our bedside, listen to our ramblings greet us with enthusiasm, turn us into playful children, and never tire of our presence. Millions of U.S. families know this firsthand. According to the American Veterinary Medical Association, 43 million households own a dog, 36 million own a cat, nearly 3 million own a bird and almost 2 million a horse. We know that having a pet in our home makes us feel better, and research backs up those feelings. Researchers have also found that cat owners have fewer strokes and are less likely to develop asthma if exposed to cats as infants. Improved heart health is another potential physical benefit of interacting with animals for older adults. According to Animal Planet, both the CDC and the National Institute of Health (NIH) have conducted heart-related studies on people with pets. In one study of 240 married couples, pet owners had lower blood pressure and lower heart rates during rest than people who did not own a pet. The same was true of stockbrokers with high blood pressure who adopted a cat or dog in another study. Animals are proven to be one of the biggest (and furriest!) stress busters for older adults. It takes just a few minutes of playing with a dog or cat or watching fish swim to feel less anxious and stressed. That’s because observing animals naturally lowers cortisol, a hormone associated with stress, and boosts serotonin, a chemical associated with wellbeing, according to WebMD. Pets can be deeply emotionally comforting to older adults who have recently lost a spouse or loved one. This may explain why pet ownership increased 17.7 percent between 2006 and 2011 among people who were divorced, widowed, or separated, according to the American Veterinary Medical Association. Pets, especially dogs, force owners outdoors at least a couple of times a day, and that means they are more likely to meet and interact with others. Plus animals can help people feel comfortable meeting new people because they are natural conversation starters. Think about it: What animal lover can pass a friendly looking dog without stopping to give him a pat on the head, ask his name and have a quick chat with the owner? Adopting a dog or cat is easy and usually inexpensive, but pet ownership comes with lots of responsibilities. Are you willing to rise early and let a dog out? Does your budget have room for pet food, annual vaccinations, boarding while on vacation and other expenses? Do you have space in your house for a litter box, dog bed and toys? What other lifestyle accommodations will you have to make? Sometimes the answer is foster care. 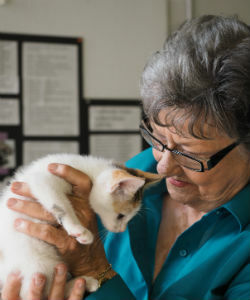 You become a trained volunteer and, when available, accept kittens or other animals needing temporary housing. Contact your local animal shelter or humane society for more information. Also consider pet sitting for a friend. A few days with a dog or cat might be just the physical and emotional boost you need. Many retirement communities have therapy animals that come by for weekly visits. Kendal at Oberlin has five therapy dogs, along with three cats that live at the Stephens Care Center. Residents are always welcome to stop by for their pet pick-me-up.